The arthroleptis troglodyte, or “Cave Squeaker,” had hopped off the radar in 1962 and was thought to have gone extinct. 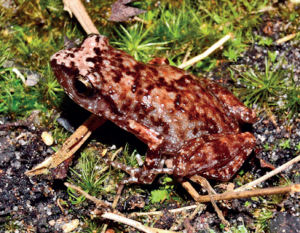 Then, in 2017, a scientist heard the distinctive squeaking call of the tiny frog, and found a living specimen in the Chimanimani Mountains of Zimbabwe. Since then, several frogs have been collected to breed more and finally release them into the wild again. This critically endangered frog might be able to make a comeback. 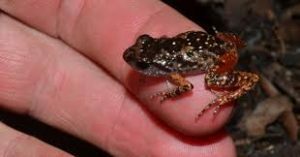 The Squeaker is not a “true frog” in that it hatches out of its egg, not as a tadpole, but as a tiny frog. The tadpole stage happens inside the egg before hatching occurs. The eggs must be laid in a damp place, but this species of frog does not need standing water in which to live through a tadpole phase of development. Luckily this tiny frog has scientists on its side, working to make sure it does not completely disappear from the earth. 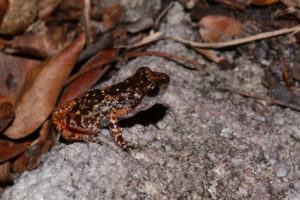 To learn more about the Squeaker Frog, click here on the “Red List” which keeps track of endangered species. You may see that the list has not yet been updated to reflect this recent rediscovery of the Squeaker.